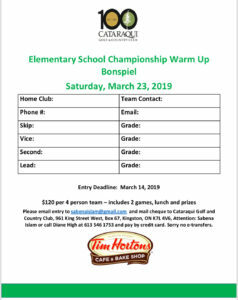 Registration includes lunch, snacks and prizes for all participants. No competitive teams allowed. 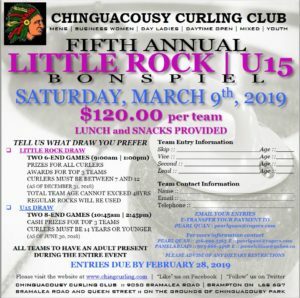 Join us on Saturday, March 9th, 2019 for our 5th annual Little Rock/U15 Bonspiel. 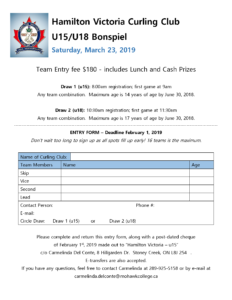 Looking for a bonspiel as a warm up before the Pinty's Elementary School Championship or looking for a bonspiel to end the season? 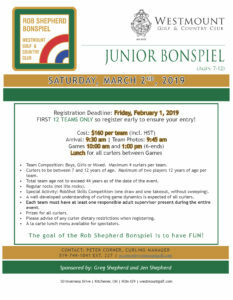 Well, this is the bonspiel for you! 2 games, lunch and snacks. Prizes for everyone! 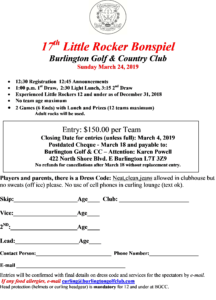 Little Rockers 12 and under- No team maximum 2 games- 6 ends each lunch and prizes Registration 12:30 Game 1- 1:00 2:30 Lunch followed by Game 2 Prize presentation to follow 8 outside teams and waitlist kept. 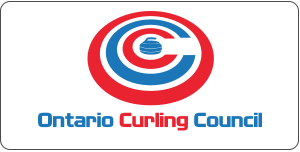 Past history- teams from Barrie, London and Rochester and surrounding area.